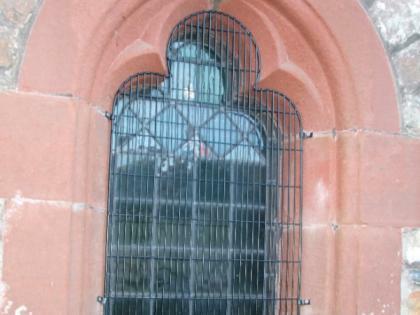 Craftsman Glass supply and fix Stainless Steel , Black powder coated wire guards , all our guards are manufactured with a British made 304 stainles steel welded mesh, and fitted into the stonework using stainless steel screws and brass fixings also black powder coated. In an ideal world, there would be no need to provide protection to our historic windows, but sadly this is not the case and as one of the most vulnerable parts of a historic or ecclesiastical building is the leaded windows, then protection for the windows must be considered. Contact us today for further information, please click here.. It should be remembered that these windows are a focal point of both worship and vision and therefore protection of them must be sympathetic and allow the windows to be viewed in their entirety. The top of the range wire guard is one made of stainless steel and powder-coated in black. The technique known as powder coating gives good protection to the Stainless Steel and offers a longer life span than the galvanising process. There is a real architectural advantage to the black finish of powder-coated guards. 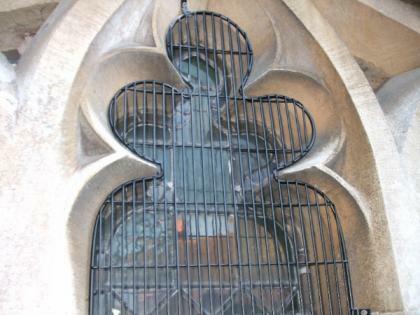 The outer surface of stained glass naturally has an overall black finish and so the guards to some extent ‘disappear’ .